Need something durable to wear, but don't feel like flip-flops or sandals? Let me introduce to you “Espadrilles”. Typically, they are constructed from lightweight cotton or canvas with a soft sole and jute-fiber braided around the edge. Espadrilles have now become more fashionable over many years and they can be worn by both genders plus they are comfortable to wear without your socks and are breathable. 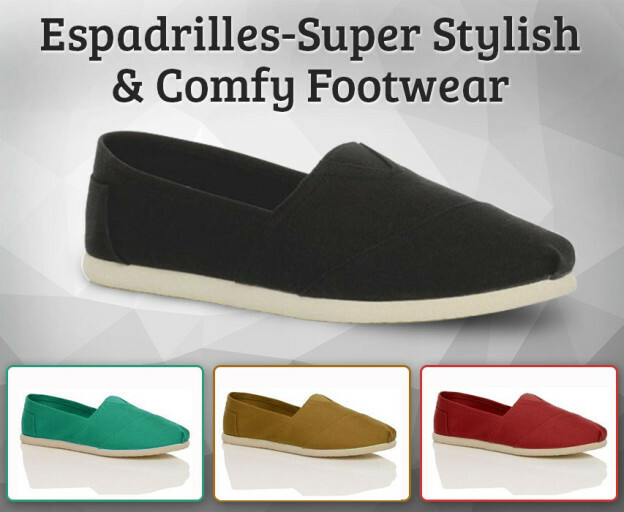 Espadrilles are casual and they are considered like outdoor slippers than shoes. They are definitely not the footwear which you can take into a business meeting. However, they are perfect for those who are planning for their vacations or walking their dog in the streets. Also, festivals and outdoor gatherings are also a good fit for espadrilles. Espadrilles carry a metrosexual appearance, so it's important to keep things looking as masculine. Avoid those violets and hot pinks, instead, go for neutral colors like black, light tan or navy. If you like patterns, make sure that you don't get anything which will clash with your attire. How to get proper fitting? Traditional espadrilles are naturally loose fitting, so don't bother too much if the shoe is slightly slack. But still if this bothers, you may find the next size is more supportive and snug. On the other hand, modern espadrilles are constructed along the lines of plimsolls with support around the upper area, which is completed with elasticised stretch bands. It is best to try on several pairs unless and until you get a comfortable result. A Final Word: Always remember that espadrilles are not constructed for regular footwear and don't have the same lifespan like your leather shoes or sneakers. Avoid taking espadrilles near water because espadrilles hate getting wet. By the way, the wedge-shaped high heels are for the ladies only.